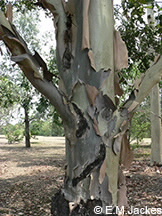 This north Queensland tree has fibrous bark on the base of the trunk followed by smooth bark which is usually greenish. Most of the leaves are juvenile or intermediate phase leaves, they are broadly ovate or even peltate and there are hairs on the petioles and veins. 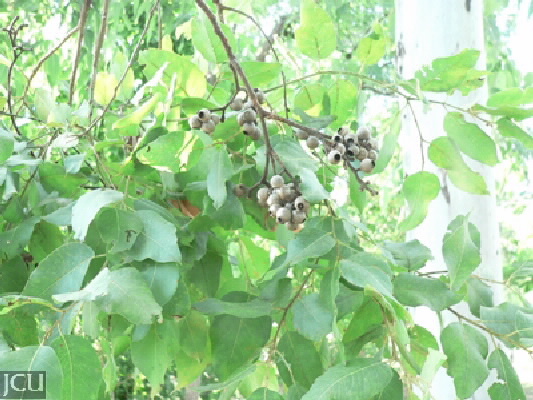 The adult leaves are broad 10-14 cm long and to 3.5 cm wide. Flowers white in large corymbose panicles on the outside of the foliage. Fruits globular to 1 cm long and wide, valves deeply included.